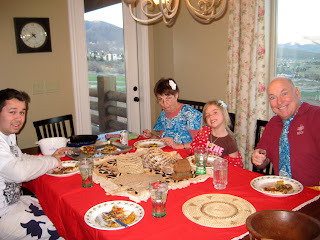 An awesome thing about being married is sharing the holidays, we’ve pretty much been celebrating every holiday twice. I guess being married implies that motherhood is imminent so even though I’m not a mommy, I even got some special treatment today. At church I was given one of the flower corsages, the Hagens gave me a money tree, and Brad got me a dehydrator! It was so sweet of him and I was so surprised, I wonder if I’m only person who had been brought to tears by the gift of dehydration? A few months ago I was talking to my mom about when her and my dad lived in Samoa. 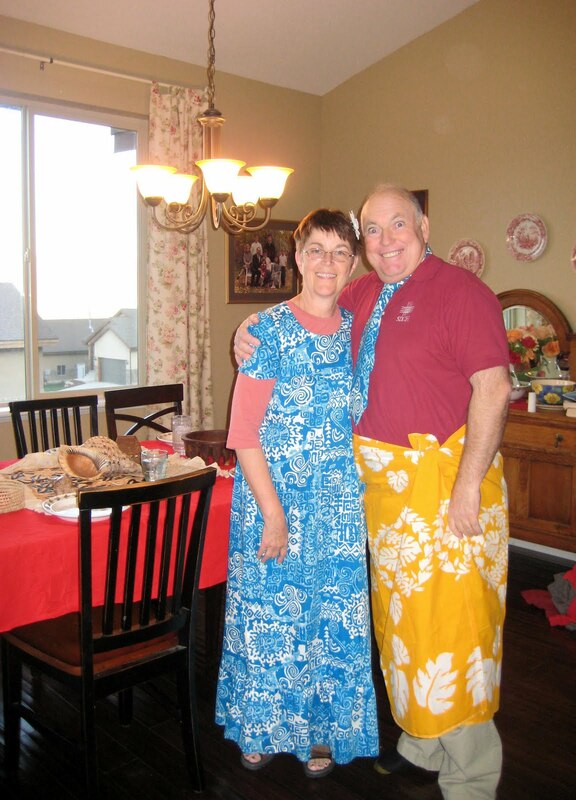 My parents served a mission there as a young couple for a couple years with 2 little kids and had kid #3 in Samoa. She told me her favorite thing to eat there was this delicious Palusami, taro leaves cooked with coconut milk. My parents haven't been back there in over 30 years. 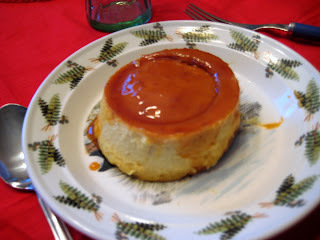 As mother's day approached I decided to plan a special meal for my mom and to surprise her by featuring Palusami. I figured I could do some google research and figure it out. I do that all the time, but normally with something I've at least seen or tasted before. I planned a "perfect" island themed dinner. Jamaican Jerk chicken pizza, marinated & grilled pineapple, palusami, and mango flan for dessert. I literally worked on the meal all day. 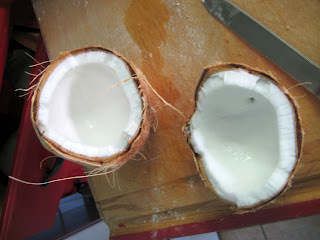 I cracked open coconuts. 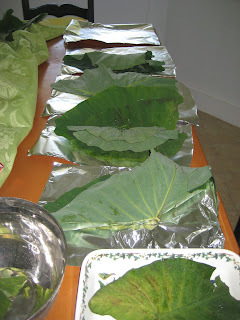 I washed giant taro leaves and poured coconut milk with sauteed onions in them then wrapped them in foil. I felt awesome. I brought my parents outfits from Samoa for them to wear and a bunch of their Samoan décor from the storage room. I was so excited for this special meal I thought I had planned perfectly for my mom. Apparently, guys at Polynesian markets and people who blog about how to make palusami assume you know how to cook with taro leaves… from what I saw on the Internet cooking times varied, so I guessed. We began taking bites and my husband suddenly said he was having an allergic reaction, all of the sudden we all had tingly mouths and throats. My mom passed the Benadryl around the table. What had gone wrong? I washed the leaves… Once the reactions had subsided we discovered on Wikipedia that taro leaves are toxic and contain calcium oxalate which is removed by fully cooking them, apparently low doses undercooked can cause tingling sensations and swelling in the mouth and throat. In larger doses it can cause comas and such. So instead of having a “perfect” meal, I poisoned my family for mother’s day and created a “perfect” memory. Today we had Brad’s family over and I had a much safer meal planned- Italian. Gnocci, this stuffed mini focaccia (I entered it a while back in an online cooking competition, this is my no shame post...), and a chocolate raspberry trifle for dessert. Very safe, very yummy. Very much forgot to take a pic. En final- My mom is probably one of the nicest people I know. Everyone who knows her likes her- she looks for the best in people, is very down to earth, and has had amazing experiences in her life that she always faces with faith. My mom rocks. I’m happy to have a new mom to celebrate with in my life now too, Annabella is an ideal mother-in-law and has made me enjoy sharing in all the new experiences and traditions with the Hagens. Boil potatoes in a large pot with salted water until cooked, ≈15 min. Remove with a slotted spoon and reserve liquid. Rice potatoes with a ricer and place on cookie sheets to cool. Let potatoes dry at least 5-10 min. Add more water to the pot and bring potato water to a boil. In a bowl whisk eggs with salt and add potatoes, stir. Gradually but quickly stir in the flour. Divide dough into 6 pieces and roll each into a ½” rope on a floured surface. Slice ropes into ½”pieces. (Can roll with the back of a fork to create ridges if desired.) Drop gnocchi into boiling water in batches. Cook for 2-3 min; they should rise to the surface when fully cooked. Remove with a slotted spoon and drain slightly before continuing. Toss in browned butter and Parmesan cheese, Rosa sauce, pesto, or coat with any pasta sauce. 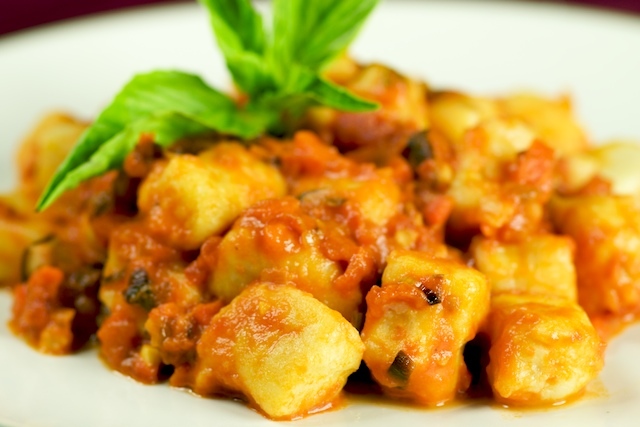 While boiling potatoes for gnocchi: Blend tomatoes and simmer in a sauce pan ≈10 min. Add remaining ingredients except cream. Bring to a boil then add cream. In a large frying pan heat 1 Tbs butter with 1 Tbs olive oil. Add gnocchi as it finishes cooking and sauté in the oil with 1-2 cloves minced garlic. Add tomato cream sauce, then ≈1/3 C parmesan cheese. Serve hot.